Waist whittling recipes for the rest of us. If you like rice cakes, stop reading now. This post is not for you. I’m 54 pounds closer to seeing my long absentee abs, and not once has it involved newfangled “health dishes” masquerading as food suitable for human consumption. To pass muster with my palate, recipes should be as savory as they are filling. Bonus points for cheese in any form. With that in mind, and for all those who have reached out asking for good eats, here’s the “skinny”. Whoever first declared that necessity is the mother of invention must have moved far away from her once favorite lunch spot. No wait – that’s just me. Oh how I miss the southern kitchen brilliance of Kay Bruno and Cafe Iz! Multiple batches later, here ’tis. And if not exactly up to Rocky Ridge Social Club standards, I’d wager it’s awfully close. 1 whole fresh jalapeño, minced (never, ever the ballpark nacho grade stuff). Freshly ground salt and black pepper to taste. Grating your own cheese makes all the difference. Pre-shredded impacts taste, and not for the better. Mix all ingredients, spread on fresh celery sticks and enjoy! MFP entry: “Pimento Cheese Spread”, Homemade, 0.5 cup, 207 cals. And yes, that’s pimento with only one “i.” Curious about whether it’s pimiento or pimento, I found (and agree with) Southern Living’s take on the matter. Crustless Spinach Quiche with Blackened Onions. Lord y’all. Add a side of in season berries and this is like Bed & Breakfast deliciousness. The blackened onions make the dish. For a primer on how to prep the edible bulb, this 2009 Diner’s Journal blog post still holds up. Coat pie pan with cooking spray, mix all ingredients thoroughly, and bake for 30 mins at 350. 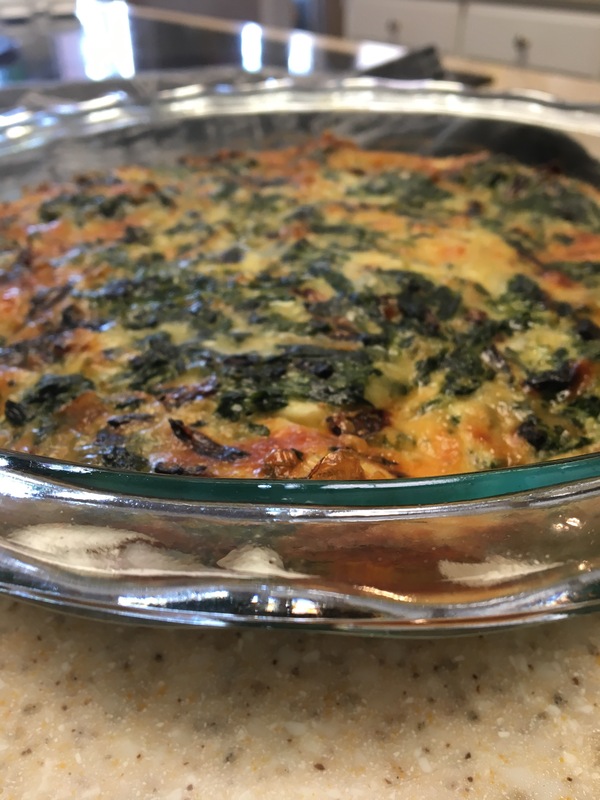 MFP entry: Crustless Spinach Quiche, Allrecipes, 1/8 slice, 232 cals. OMG. This is the fish for people who think they don’t like fish. Choose wild caught from your nearest grocer, use this ridiculously simple Kitchn hack to peel the garlic (thanks Dad! ), and snip a fistful of parsley from the backyard. Bonus? Foil makes clean up a snap. Preheat oven to 425º F. Line rimmed baking sheet with foil. Place salmon, skin side down, onto lined baking sheet. Cover salmon with another piece of foil. Bake salmon for 10 minutes. Remove from oven and remove top piece of foil. Top with garlic, Parmesan and parsley mixture. Return to oven uncovered and allow to bake until registers 135º F when checked with an internal thermometer. The Parmesan cheese should have melted and lightly browned. MFP entry: Salmon Fillets, Homemade Herb Crusted, 3 oz, 195 cals. No picture. I ate it too fast. Yes, it is that good. Forget other takes on this classic chilled soup. Top with fresh basil and grab a spoon. We can grieve the end of tomato season together. Fill a 6-quart pot halfway full of water, set over high heat and bring to a boil. Make an X with a paring knife on the bottom of the tomatoes. Drop the tomatoes into the boiling water for 15 seconds, remove and transfer to an ice bath and allow to cool until able to handle, approximately 1 minute. Remove and pat dry. Peel, core and seed the tomatoes. When seeding the tomatoes, place the seeds and pulp into a fine mesh strainer set over a bowl in order to catch the juice. Press as much of the juice through as possible and then add enough bottled tomato juice to bring the total to 1 cup. Place the tomatoes and juice into a large mixing bowl. Add the cucumber, bell pepper, red onion, jalapeno, garlic clove, olive oil, lime juice, balsamic vinegar, Worcestershire, cumin, salt and pepper and stir to combine. Transfer 1 1/2 cups of the mixture to a blender and puree for 15 to 20 seconds on high speed. Return the pureed mixture to the bowl and stir to combine. Cover and chill for 2 hours and up to overnight. Serve with chiffonade of basil. 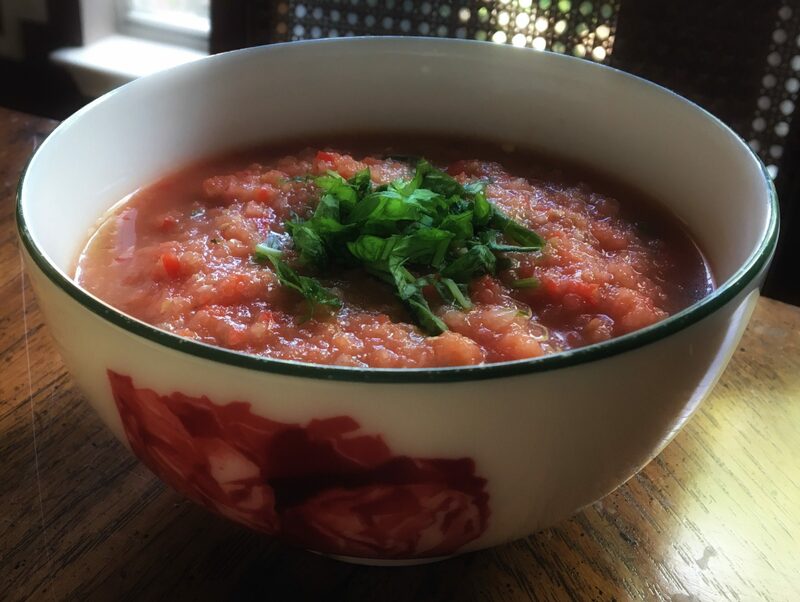 MFP entry: Gazpacho, Alton Brown’s recipe, 1 Bowl, 184 cals. Summer in a bowl, y’all. Light enough for lunch and with a little rosemary thyme chicken tossed in, hearty enough for supper. Plus, it’s the Pioneer Woman. Haven’t found a recipe of hers yet that didn’t make my tastebuds sing. In a jar or bowl, mix together the olive oil, lemon juice, garlic, salt, and pepper until totally combined. Place the orzo and all the other ingredients in a large mixing bowl and pour the dressing over the top. Stir to combine, taste and adjust seasonings, and refrigerate at least an hour before serving. Top with more feta and parsley and serve as a main dish salad or with grilled chicken, fish, or burgers! 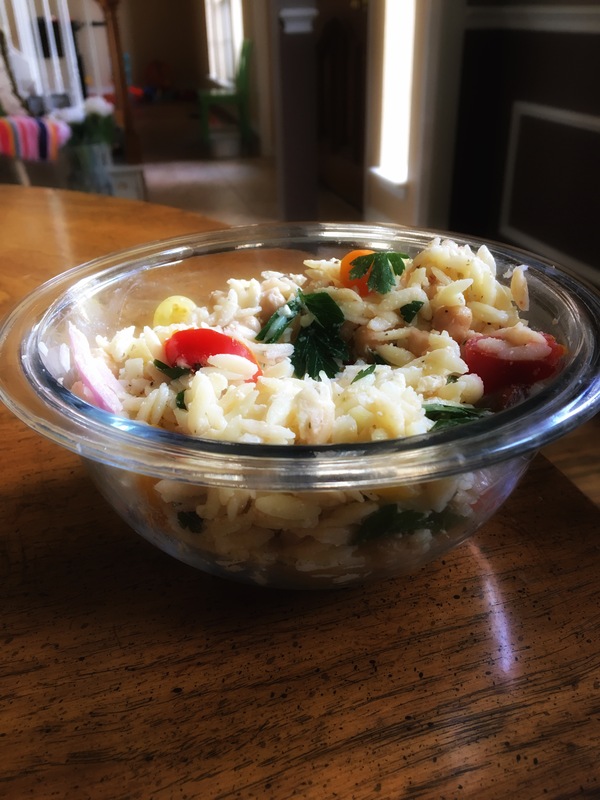 MFP entry: Salad, Greek Orzo Prepared, 1 cup, 330 cals. Holy health. Why did I under utilize the spice rack all these years? Two of my favorites, rosemary and thyme, take center stage in this staple I prepare every Sunday for the week ahead. It’s awesome post workout, whipped into a simple chicken salad lunch, and makes dinner casserole prep a cinch. I once dreaded cooking raw chicken. If that’s you, you’ll love this method. MFP entry: Boneless, Skinless, Sauteed Chicken Breast, 3 oz, 138 cals. My formerly weak protein game is no more! On the days when I’m not noshing on quiche for breakfast, egg salad is for lunch. It travels well too. Paprika, salt and pepper to taste. MFP entry: Rebecca’s Egg Salad, 1 cup, 257 cals. Previous Previous post: Let them be salt and light. Next Next post: Don’t let the Muggles get you down. Love your inspiring blog and recipes! Thanks for sharing these healthy and tasty options!! Thank you for saying so Dee! I’m glad you enjoyed the post. Now to find recipes that will carry me into fall and holiday season! Were so proud of you back home, Rebecca! Love seeing how well you’re doing. Since I can’t eat cheese, I’d love to see more good recipes without it. I’m sure these are great ones for cheese lovers!